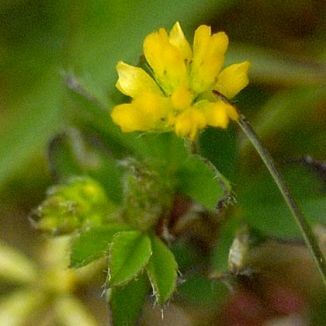 Also known as Yellow Clover, this is a low-growing, mat-forming, hairless annual which has between 5 and 20 yellow peaflowers in compact little flowerheads 8-9mm across. The trifoliate oval leaves are slightly notched, and not pointed, the terminal leaf being short-stalked. 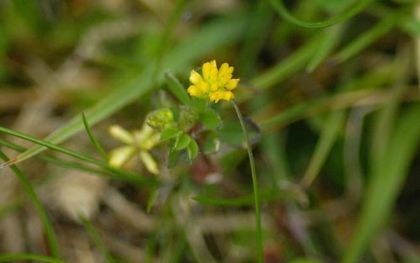 Lesser Trefoil flowers from May to October and can be found growing in dry, grassy places and wasteland. In autumn, the flowers turn brown and droop hiding the tiny straight pods. It is native plant belonging to the family Fabaceae. Clovers and other peaflowers help to supplement nitrogen supplies to the soil by fixing nitrogen from the atmosphere. They do this by means of the nitrogen-fixing bacteria which live on nodules on the plant roots. Compost made from the residue of such plants also forms a useful addition to the soil. Without nitrogen an estimated one-third of our current agricultural production would be lost.